The capybara's unique adaptations and large size help to make it one of the better known animals in the world. Because its size and superficial appearance, people sometimes are surprised to learn that it is a rodent rather than a relative of the pig. Remarkably, it has been classified as a fish in the Catholic religion, a fact that made it historically popular during times when tradition dictated the eating of fish (Lent, Fridays). Capybaras provide value for the ecosystem as part of food chains, converting vegetative matter into forms consumed by predators such as jaguars, caimans, and anacondas. For humans, they have been used as food and as a source of leather, and they add to the human wonder of nature. The capybara is the only living species in its genus, Hydrochoerus. Its common name, capybara in English and capivara in Portuguese, derives from Kapiÿva in the Guarani Indian language, meaning "Lord of the grass" (JP 2007), perhaps reflecting the fact that grasses are the favorite food of this rodent (BZ 2007). Its scientific name hydrochaeris. is Latin for "water hog" (CZ 2007), reflecting it semi-aquatic existence and its superficial resemblance to a pig. However, capybaras are rodents (Order Rodentia), classified with rats, mice, and squirrels. Capybara are found wild in much of South America (including Panama, Columbia, Venezuela, Brazil, Argentina, French Guiana, Uruguay, Peru, and Paraguay (BZ 2007). They can be found in densely forested areas near bodies of water, such as lakes, rivers, swamps, ponds, and marshes (NZP 2007), such as flooded savanna and along rivers in tropical forest (BBC 2007). The population of capybaras in the Brazilian Pantanal, the world's largest wetland system, is estimated to approach one half million (Swarts 2000). Capybara exhibit marker Capybaras have heavy, barrel-shaped bodies, and short heads with reddish-brown fur on the upper part of their body that turns yellowish-brown underneath. Capybaras have slightly webbed feet and only a rudimentary tail; their back legs are slightly longer than their front legs and their muzzles are blunt with eyes, nostrils, and ears on the dorsal (top) of their head (BBC 2007). Capybaras have a total of 20 teeth. Like other rodents, the front teeth of capybaras grow continually to compensate for the constant wearing-down of eating grasses (BZ 2007). 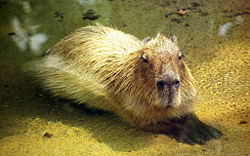 Adult capybaras are the largest extant rodents. They may grow more than four feet (130 centimeters) long and 50 centimeters tall (1.6 feet), and commonly weigh more than 50 kilograms (110 pounds) (NZP 2007; Magalhaes 1992). Females are slightly heavier than males (CZ 2007). Though now extinct, there once existed even larger capybaras that were eight times the size of modern capybaras; these rodents would have been larger than a modern day grizzly bear) (BBC 2007). Capybara lounging in a shallow pool at the Hattiesburg Zoo in Hattiesburg, Mississippi. The capybara is a herbivore (more specifically, a graminivore, grazing mainly on grasses and aquatic plants, as well as fruits and tree bark. Capybaras eat their own feces in the morning in order to help digest the cellulose in the grass that forms their normal diet. During midday, as temperatures increase, capybaras wallow in water to keep cool and then graze in late afternoons and early evenings. They sleep little, usually dozing off and on throughout the day and grazing into and through the night (BBC 2007). Capybaras are excellent swimmers and can survive completely underwater for up to five minutes (NZP 2007), an ability they will use to evade predators. If necessary, a capybara can sleep almost submerged, keeping its nose just at the waterline. Capybaras have a lifespan of four to eight years in the wild, but average a life less than four years as they are a favorite prey of jaguars, anacondas, pumas, ocelots, caimans, and eagles (BZ 2007). Capybaras are social animals, usually found in groups, between 10 and 30 (though looser groups of up to 100 sometimes can be formed) (BBC 2007). 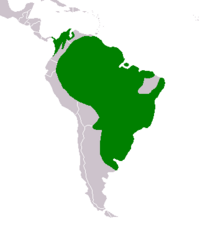 Magalhaes (1992) reports that in the Pantanal, the social groups average between 8 and 16 individuals. They are controlled by a dominant male (NZP 2007), who will have a prominent scent gland on his nose (BBC 2007), used for smearing his scent on the grasses in his territory (BZ 2007). Members in a group communicate through a combination of scent and sound, being very vocal animals with purrs and alarm barks, (BBC 2007), as well as whistles, clicks, squeals, and grunts (BZ 2007). Capybaras reach sexual maturity within 18 months and breed when conditions are right, which can be once per year (such as in Brazil) or throughout the year (such as in Venezuela and Colombia). The male pursues a female and mounts when the female stops in water. Capybara gestation is 130-150 days and usually produces a litter of four capybara babies (Magalhaes 1992). Birth is on land and the female will rejoin the group within a few hours of delivering the newborn capybaras, who will join the group as soon as they are mobile. Within a week the young can eat grass, but will continue to suckle from any female in the group until weaned at about 16 weeks. Youngsters will form a group within the main group (BBC 2007; BZ 2007). Capybara are not on the IUCN list and thus not considered a threatened species; their population is stable through most of their South American ranges, though in some areas hunting has reduced their numbers. Capybaras can be found in many areas in zoos and parks, sometimes allowed to roam freely and may live for 12 years in captivity (BBC 2007; BZ 2007). Capybaras are gentle animals and will usually allow humans to pet and hand-feed them. Capy relaxing in his water pool at the Hattiesburg (Mississippi) Zoo. Capybaras are hunted for their meat and skins in some areas, and otherwise killed by humans who see their grazing as competition for livestock. The skins are turned into a high-quality leather. Capybara meat may be dried and salted, then shredded and seasoned (Lipske 2006). Considered a delicacy, it is often served with rice and plantains (Ellsworth 20050. In some areas, capybaras are farmed, which has the effect of insuring that the wetland habitats are protected. Their survival is aided by their ability to breed rapidly (BZ 2007). 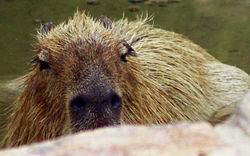 During the Catholic observation of Lent, during which consumption of meats and oils are traditionally avoided, capybara meat is especially popular as the church classified the animal as a fish in the sixteenth century, and has never reversed this erroneous classification (Ellsworth 2005; JP 2007). Capybara at The National Zoo in Washington, D.C.
Bristol Zoo (BZ). 2007. Capybara. Bristol Zoo Gardens. Retrieved September 27, 2007. British Broadcasting Corporation (BBC). 2007. Science and nature: Animals (Capybara). BBC. Retrieved September 27, 2007. Chester Zoo (CZ). 2007. Capybara (Hydrochoerus hydrochaeris). Chester Zoo. Retrieved September 27, 2007. Ellsworth, B. 2005. In days before easter, Venezuelans tuck into rodent-related delicacy. New York Sun March 24, 2005. Retrieved September 27, 2007. Jungle Photos (JP). 2007. Capybara natural history. Retrieved September 27, 2007. Lipske, M. 2006. The ranchers' favorite rodent. National Wildlife 44(2). Retrieved September 27, 2007. Magalhães, N. W. de. 1992. Conheça o Pantanal [Know the Pantanal]. São Paulo: Terragraph. National Zoological Park (NZP). 2007. Capybara facts. Smithsonian National Zoological Park. Retrieved September 27, 2007. Swarts, F. A. 2000. "The Pantanal in the 21st Century: For the planet's largest wetland, an uncertain future." In F. A. Swarts (ed.) The Pantanal. St. Paul, MN: Paragon House. ISBN 1557787913. This page was last modified on 12 February 2009, at 01:12.